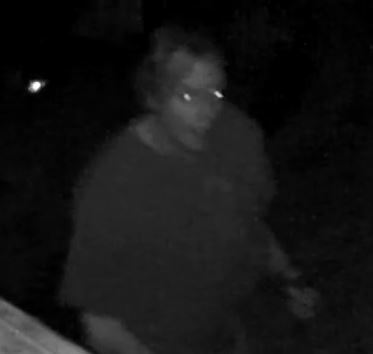 LAKE OSWEGO – On Thursday, August 28, 2014, at 2:46 am, a male suspect was seen masturbating in a residential driveway in the 3000 block of Douglas Circle. The homeowner chased the suspect, but lost him in the area of Twin Fir Road near Upper Drive. Later, it was learned that video existed of the suspect doing the same thing in the back yard of a house in the same block of Douglas Circle. 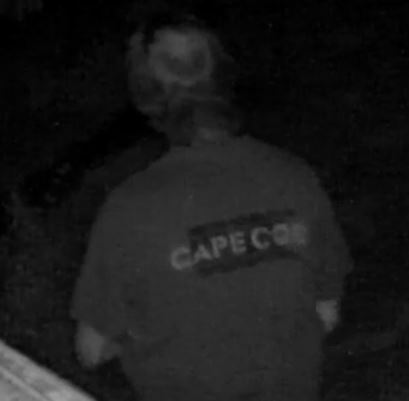 Still photos from that video are attached to this release, including one of the distinctive logo on the back of the suspect’s shirt. At one point during the video, the suspect leaves the view of the camera and then returns with no clothing on. He can be seen peering into the windows of the house and masturbating. He is also seen drinking what appears to be a beer and, at another point, he appears to be smoking something. Photos of the suspect can be found on our website and our Twitter feed. Anyone with information on the identity and/or location of this suspect is urged to call Lake Oswego Police at (503) 635-0238.